Which rules? Teaching or Learning? 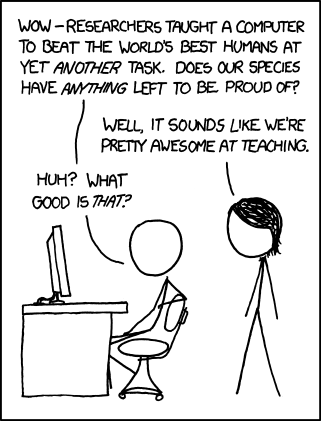 Another thought provoking cartoon from the good fools at xkcd. There are actually two interesting thoughts in this one. Yes, humans are pretty good teachers at that. More importantly, however, we manage to get by even with less than stellar teachers because humans are so supremely gifted at learning. Computers demand extraordinarily adept teachers because computers are such obtuse learners and that is the only possible way they will learn. Humans, children in particular, are such natural learners that they can survive in spite of the most mediocre of teachers. Which may be one of the reasons we’re too willing to tolerate mediocrity. I am an EdD student and a nurse. I was wondering if anyone has experience or information related to whether the attitudes (positive or negative) of nurse educators may affect the attitudes of the nursing student related to care of our elderly.